Good morning! It's a beautiful HOT spring day here in Sunny North Carolina! It's already 72 degrees on its way to 88 today, well above our average high of 73 degrees. Well, my freshly planted gardens will love it I'm sure. I watered them all this morning. 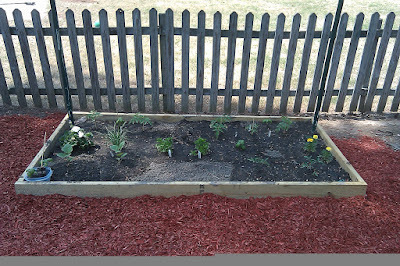 I wanted to write a little update about what I'm calling my "secondary gardens." 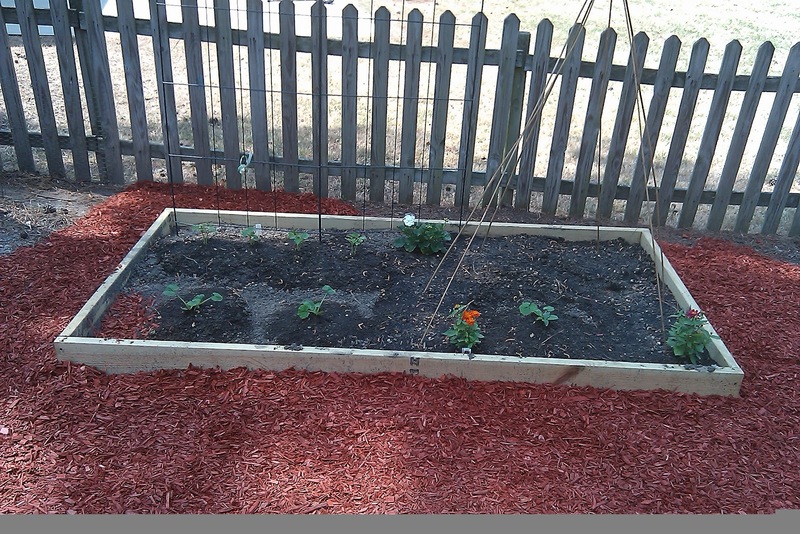 In addition to my three raised bed gardens, I've got some other plans for plants scattered around my yard. 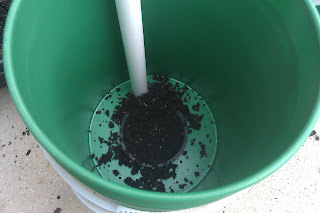 A few days ago, I wrote an article about how to build self-watering planters out of 5 gallon buckets. Well, I now have plants in them! 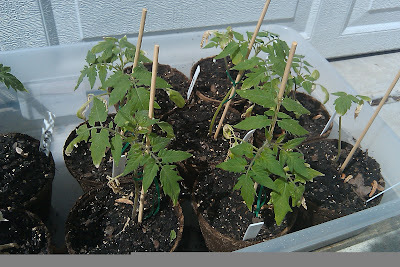 Two cherry tomatoes (Burpee Super Sweet 100 Hybrid), two grape tomatoes (Jellybean Hybrid), and one Black Beauty Eggplant. Not sure if I'm going to cage, stake, or string the tomatoes. To be determined I guess! Over in my side yard, I've planted a variety of things that I don't really care how well they do. These areas get limited sunshine (5-7 hours) and the soil isn't so great, even after I amended it with a couple truckloads of compost blend garden soil. I planted two large hills of pumpkin seeds (6 seeds each) and one hill of canteloupe (6 seeds). This is also where I have some of the basil planted, and a bunch of Caladium bulbs. Neither my canteloupe nor my pumpkins did very well last year but this year the canteloupe is in the ground in a sunnier location and the pumpkin was in a 12" square pot last year which is not suitable for pumpkins. I think both will do better this year. Also, in the 2'x8' raised bed that I grew the birdfeeder gourds in last year, I planted a couple of zucchini and a roma tomato. This garden gets a decent amount of summer sun because it doesn't get shaded by the house in the late afternoon. In order yard-related news, my Indian Hawthornes are blooming, the Catnip is looking great and starting to bloom, and the Frost Proof Gardenias survived the winter extremely well and are looking great. It's a beautiful warm day here in sunny North Carolina! The weekend's tornado outbreak put a slight damper in my weekend plans, but I did manage to get to the farmer's market Saturday morning to buy some plants - I picked up some oregano, chives, parsley, rosemary, white geraniums, marigolds, zinnias, zucchini, eggplant, cucumber, Celebrity Tomatoes, and some Mississippi Silver Cowpeas. After the bad weather passed and the sun came out, I was left with an hour or so of daylight to do my planting. I also picked up some bean incculent and started my Kentucky Wonder pole beans soaking in a cup of rainwater. These I planted Monday morning after sprinkling the beans with the innoculant (which helps the beans put nitrogen back in the soil). 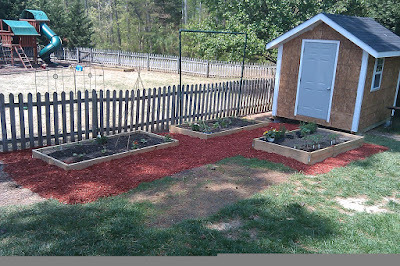 Finally, I got some mulch spread around the gardens - here are some pictures! 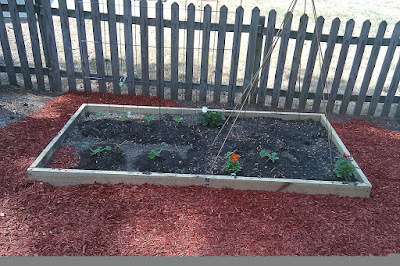 Bottom Right - two zinnias and one zucchini. Two Big Beef tomatoes (top left), and three Early Girl tomatoes (top right, plus two Celebrity tomatoes (bottom right). Plus some basil, chives, parsley, white geranium, and marigold. 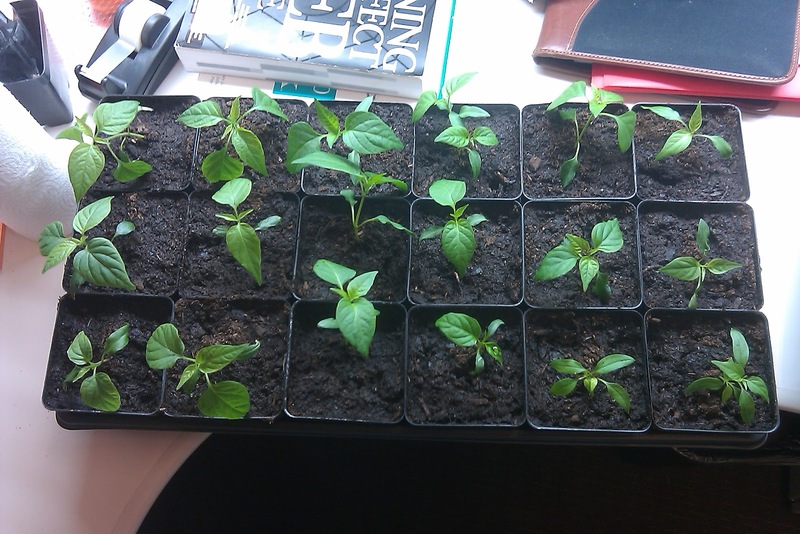 Look at these beautiful pepper seedlings! They're still spending time at my desk at work, underneath a pair of standard T8 fluorescent lights. But they spend at least 4 days a week for 6 hours each of those days out on the porch soaking up direct sunlight from 8am to 2pm. So they're not leggy at all - nice and green and healthy looking. I had transplanted them a few weeks ago from the small jiffy peat pellets into these 4" square pots, and there are roots coming out the bottom of the pots now. They're totally ready to transplant into the ground! HOWEVER, it's not time yet. 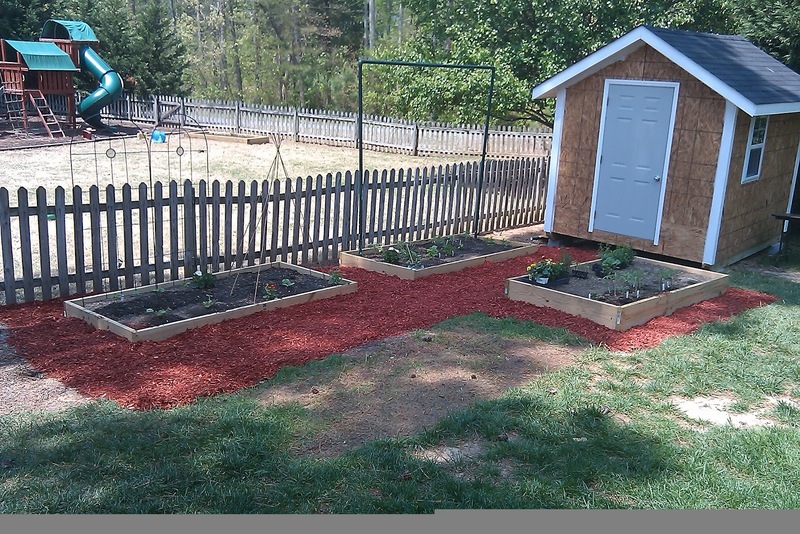 According to the N.C. State Vegetable Garden Planting Guide, hot and sweet peppers both like soil temperatures of 65 degrees and should not go into the ground until early May. That being said, I'm probably going to keep these here at work for another week to week and a half, and then take them home to plant the weekend of April 30, though I might do it as early as Tuesday April 26th. I've been watering these plants (through the tray liner) a couple times a week. When they sit out in the sun they soak up the water pretty good. I gave each try 48oz of water this morning and both tries are dry now with the top of the soil in each pot being just a little moist. Perfect. I don't know about you, but I've found that pots of any kind are expensive - self-watering pots even more so. Last year, I grew some of my plants in 12" plastic pots that I purchased at Home Depot. Unfortunately, a 12" pot isn't anywhere near big enough for the root system of a tomato plant, and what you end up with is a pot that dries out after a few hours in the 95 degree summer sun here in North Carolina. Self-watering pots help with this quick dry problem, but store bought containers like the Earthbox or the Autopot are $50 or more. preferably food grade buckets. Your local fast food joint will often have pickle buckets that they just throw out. Ask them to save some for you. Home Depot sells nice orange buckets for less than $3 each but that's a bit pricey compared to free if you can get them. Try Chick-Fil-A, they go through a lot of pickles! You can get this from your neighborhood hardware store, Home Depot, plumbing supply, etc. You need about 2' for each planter. They sell 2' sections at Home Depot for like $2 but you can get a 10' section for less than $4 if you want to make multiple planters. This is a little harder to come by, but the 5" size is just about perfect for this application, and they cost around a dollar. Home Depot or Lowe's generally won't carry these, but you *might* find them at a garden supply nursery - but more likely you're going to need to find a local hydroponics supply store, or buy online from Amazon or eBay. Step 1, 2, and 3. Cut a 5" hole in the center of one bucket. It's easiest to do this with a 5" hole saw, but at $35 or $40 at the local hardware store, if you don't own one of these you probably don't want to go buy one. My dad actually rigged up his router to cut my buckets for me, but that's an even more expensive tool if you don't have one! There are two more options here - use a reciprocating saw, some kind of small bladed hand saw (like the kind used for ripping drywall), or just a good sharp utility knife. The plastic bottom of the bucket is pretty thick so please don't cut your fingers off trying this last method. I did one bucket this way and it worked, but it was a little scary. Drill a 1-1/4" or 1-1/2" hole near the edge of the bottom of the bucket. Your PVC pipe will fit through this hole. I would definately recommend using a hole saw for this. 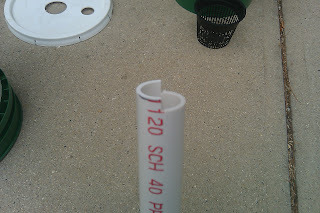 Make sure you use the right size so your PVC pipe fits through it snugly. Using a small drill bit (3/16" or 1/4") drill a bunch of small drain holes in the bottom of the same bucket. This will allow excess water to easily drip back into the outer bucket. Place the bucket with all the holes in it inside the other, as yet unblemished bucket. Figure out where the bottom of the inside bucket is, and drill two 1/4" holes just below that point on the outer bucket. These are your overflow drain holes. When you pour water into the container, you'll know when to stop when water starts to flow out these holes. 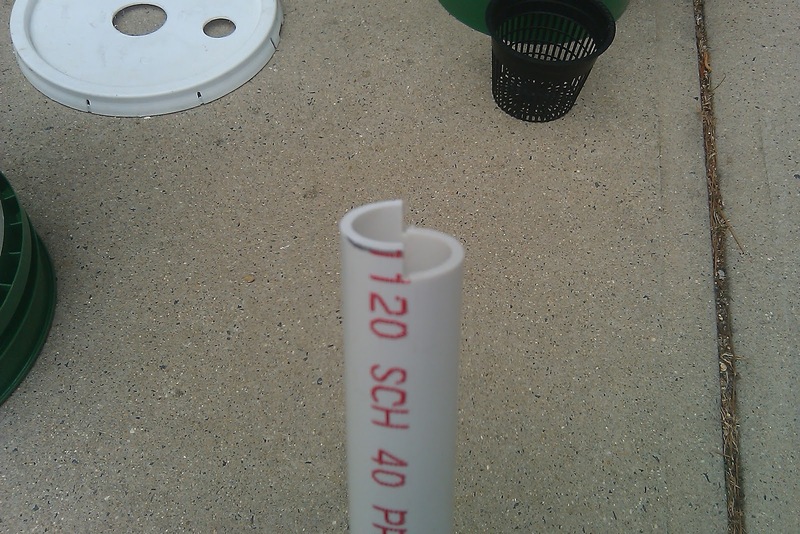 Cut a notch in one end of the PVC pipe so that it doesn't sit flush on the bottom of the bucket. Place the PVC pipe into the hole in the inner bucket. 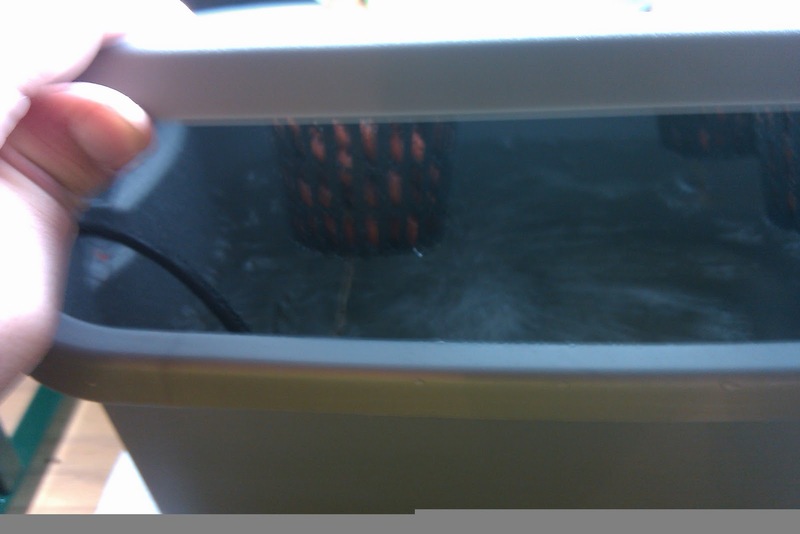 Place the net pot into the large hole in the inner bucket. Fill the bucket with moist potting mix - pre-moistening the potting mix is an important step to making sure the self-watering process works properly. Plant your seed or transplant your seedling and fill the reservoir with water using the PVC pipe. 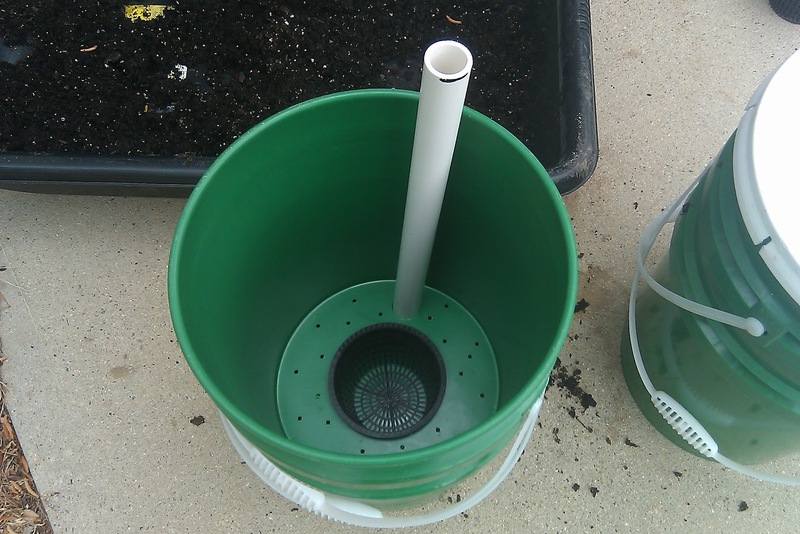 If you have a lid for one of the buckets, Cut a 1" hole in the center, and thread your plant through the hole - OR cut the lid in half and just put it on underneath the plant. 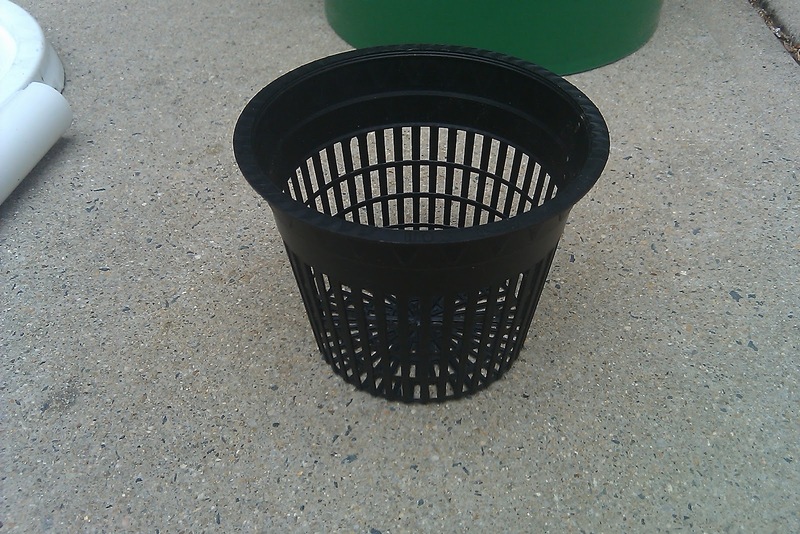 Close up of the mesh pot or net cup. Bottom of the inner bucket. 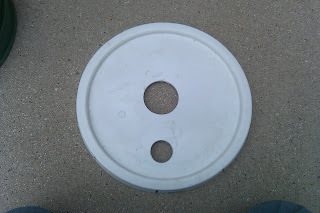 Bucket Lid with hole in center for plant and hole near side for PVC pipe. Close up of the notch you need to put in one end of the PVC pipe. Start to fill the planter, make sure to use pre-moistened potting mix. Transplant your plant into the pot (not shown) and put on the lid! I was doing some research the other day on a technique called "companion planting" - a method of choosing plants with qualities that benefit each other. 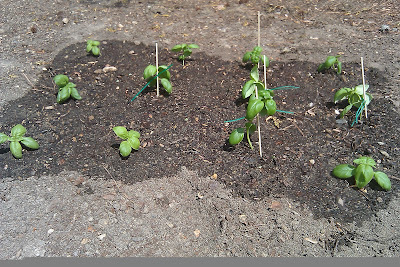 For example, you can plant basil near tomatoes to improve the growth and flavor of the toamatoes. Geraniums and Catnip repel japanese beetles. In fact, japanese beetles like to eat white geraniums but eating the foliage kills them! I found this fantastic resource on all kinds of companion plants, I highly recommend checking it out. Aside from being attractive and tasty, nasturtiums are both functional and beneficial. 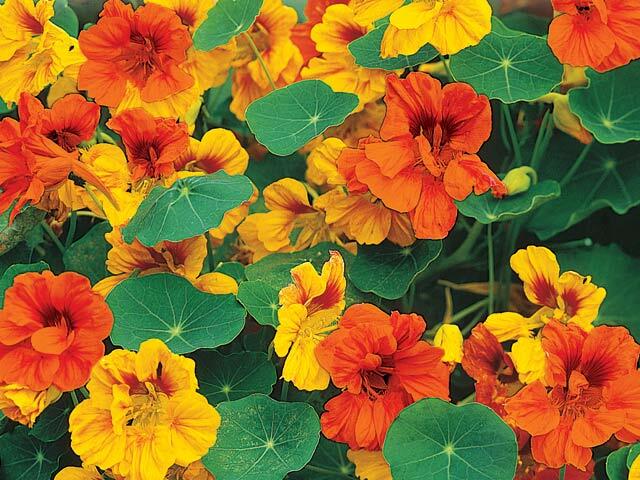 Having nasturtiums planted in strategic spots around your garden will keep rabbits, deer and other critters at bay. Who wouldn't welcome an organic, practical and attractive approach to keeping destructive critters away? They are also ideal companion plants because they will repel aphids, cucumber beetles, squash bugs, whiteflies and root knot nematodes. Plant them around tomatoes, radishes, cabbages, around fruit trees and around cucumbers. I don't really have a problem with deer, as my gardens are inside a fenced yard. However, I've seen plenty of rabbits. At any rate, the article also says the Nasturtium is extremely easy to grow from seed, though I will probably just try to find some at the farmer's market. I will definately have some Nasturtium and Geraniums in my garden! EDIT #2: Nasturtiums don't like hot weather, so I won't be planting any in my SUMMER garden... but I might throw some into my fall garden in September! Fruit or Vegetable? Ask the United States Court System! People often refer to a tomato as a vegetable, but many of you probably know that it's actually a fruit. Scientifically speaking, that is. Like all true fruits, it comes from the plant's "ovary" and bears the seeds of the plant (more interesting details here). But in 1893, the United States Supreme Court upheld wording in the Tarriff Act of 1883 which defined the tomato as a vegetable for taxation purposes. Well, apparently, something similar happened in 1947, when a U.S. Customs Court reclassified "Rhubarb" as a fruit for the same reason (even though it is clearly NOT a fruit). My hydroponic basil is doing well but getting "leggy" because I don't have anywhere near enough light on them. The little Hydrofarm Jump Start grow light that I'm using is only a 2' T5 high output bulb at 24 watts and it's really just meant for seedlings. I'm going to need a more substantial grow light if I'm going to be doing this. Anyway, here are some pictures! I am so far behind this year. Building the shed has really delayed my preparations this year. I finally got two of my three garden beds built - and one of them filled with "compost blend" garden soil from a local supplier. According to their web site, it "consists of decomposed organic material, chicken manure or cow manure, pine fines, and screened topsoil." It was a hell of a lot cheaper than the gazillion bags of Miracle Grow Garden Soil I used last year. $26 for a cubic yard, vs something like $8 a bag for a 2 cubic foot bag. For comparison, a cubic yard is 27 cubic feet. My 4'x8' garden bed at 10" deep takes about 25 cubic feet of dirt, and as I've always suspected, "one cubic yard" from American Soil & Mulch is quite a bit bigger than 27 cubic feet since I nearly filled about 1/3 of the second bed. At any rate, let's just say it would take 12 bags of miracle grow garden soil at $8 a bag, or $96 to fill ONE garden bed, so it's a big savings. 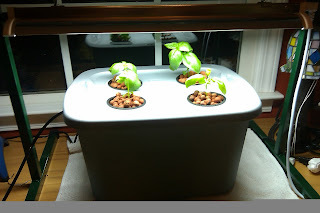 When I started my Hydroponic Basil project, I moved the rest of my basil seedlings to another "sunny window" - of course, sunny is a relative term in my house - I have no legitimate sunny windows. I noticed today they were getting horrendously leggy - they should have been in the ground a week ago and they would've been fine, but sitting in the window without the grow light caused problems, so I did an emergency planting of 12 sweet genovese basil plants out in the front "garden" ... an area which I'd tilled up over the last few weeks and mixed in some of the aforementioned compose blend to go with the three inches of decaying triple shreded pine bark that I'd been putting down for the last 6 years. Anyway, I planted most of them deep to help with their spindly natures, hopefully they'll do all right. 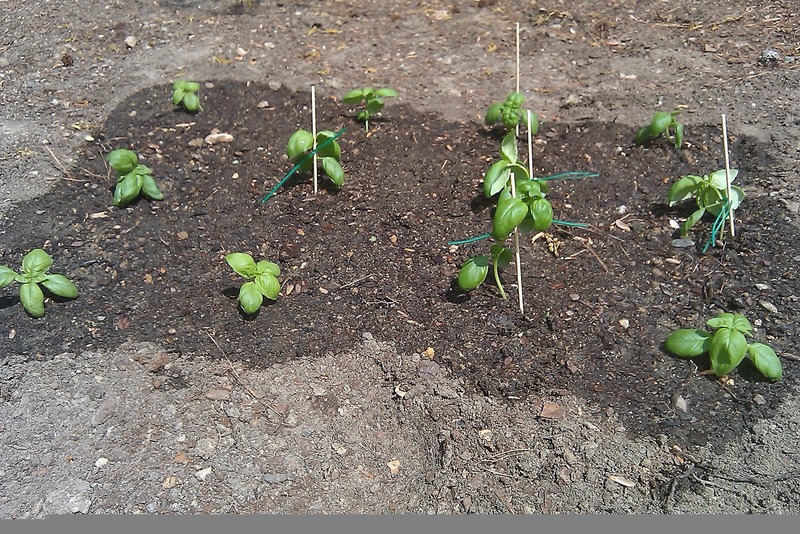 The remaining basil plants are still in their large peat pellets - the purple basil is growing much slower. They are now permanently located outside. 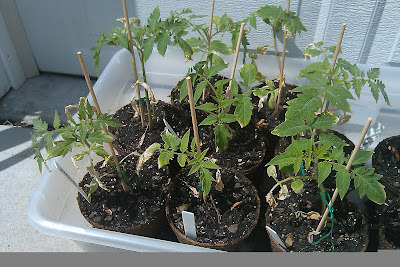 So, my tomatoe seedlings do seem to be recovering from their violent transplant. They've been outside almost every day and most nights for the last week or so. Some of the leaves dried up and died but what remains does seem to be looking more healthy now than they did a week ago. I think they'll survive. Feel free to comment if you have anything to say about these. I probably won't get around to planting my gardens until after Easter Weekend. I could do the tomatoes this weekend, as their destination garden will be completed, but I feel like they'd actually be better off in the jiffy pots for a couple more weeks - as long as they are outside soaking up the sun and as long as I keep them properly hydrated. Transplanting from the jiffy pots into the ground shouldn't cause them any problems. I could plant my other garden this weekend, which would contain the cucumbers and the three sisters garden (corn, pole beans, and zucchini squash) but that garden bed is delayed because there are two sweetgum tree stumps I need to have removed. I've got someone coming to do that on Saturday so I *might* be able to get that garden built and filled this weekend, we'll see. 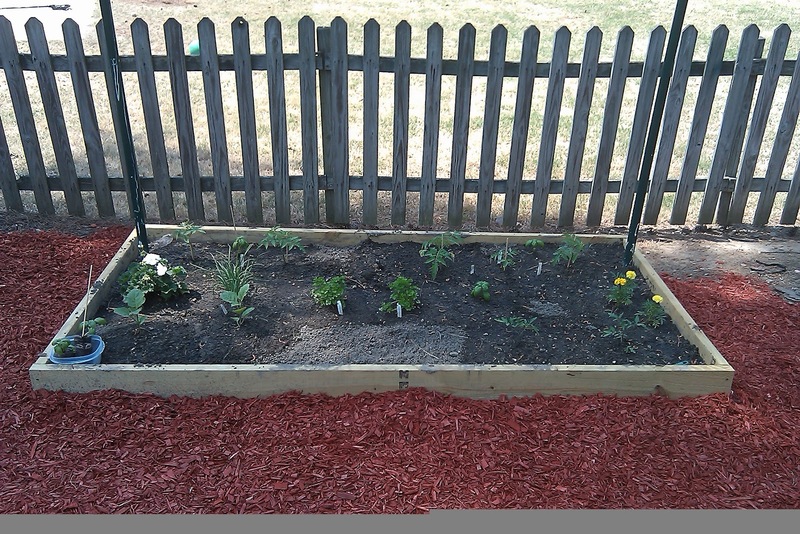 The other garden that's already completed is the most sunny, and is reserved for the hot peppers and eggplant - which I can't put in the ground until early May anyway. 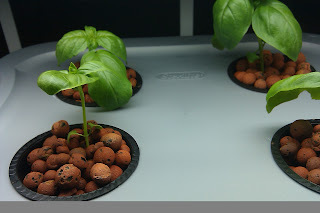 So, I started my hydroponics experiment today. 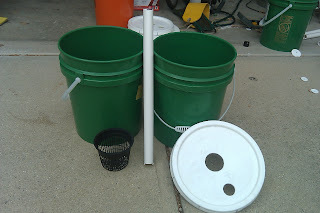 I built a Deep Water Culture (DWC) hydroponic system using a 5 gallon storage tote, an aquarium air pump, micropore air stone, 3" net pots, and some expanded clay growing media called Hydroton. First of all, I'm using tap water, because I'm lazy. 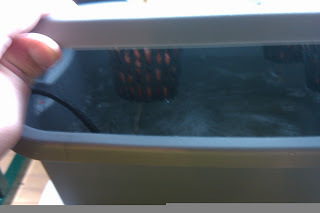 So my first step was to fill the tote with water and then run the air bubbler in it for a day or so in order to allow it to evaporate out the chlorine gas (all city water has some chlorine in it). I'm using a relatively small tote for this experiment. Make sure it's not clear - neither the lid nor the container itself can be clear. Light breeds algae, and nobody wants that. 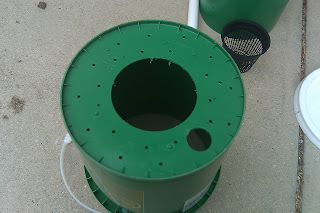 Drill a few holes in the top using a hole saw that is sized appropriately for your net pots. I'm using 3" net pots, so the 3" hole saw worked perfectly. Drill a 3/8" hole in the side very near the top for your air bubbler tubing. Clean it all up and you're done. I know, everyone makes this joke. The hydroton grow needs to be washed thoroughly to get all the dust off from manufacturing - they arrive quite dirty. So I just put them in a bucket of water, rinsed them, dumped them in a strainer, and repeated until the water came off mostly clear. The next step was to prepare and pH-balance the nutrient solution. I added my hydroponic nutrients - I'm using Botanicare Pure Blend Pro Grow solution. I needed about 22.5ml of nutrients to go with what was approximately 12L of water and tested the pH. I bought a "pH Control Kit" from Amazon that included pH test drops, "pH Down" acid solution, "pH Up" base solution, and a testing vial. I used the "pH Down" to bring the pH of my nutrient solution down to about 6.0 (it should be between 5.5 and 6.5). 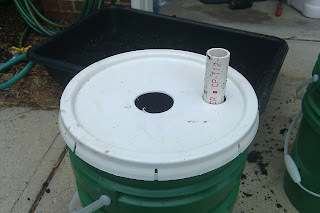 Put the air bubbler in the nutrient solution, connect the air pump, and put the lid on. 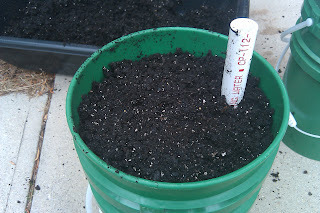 I grew my basil seedlings in large jiffy peat pellets. This worked out great because it allowed the roots to grow fairly deep and after 4-5 weeks of growing in the window, I've got some good roots going. So I peeled off the cloth and then gently washed away all (most) of the peat, leaving nice, relatively clean roots. I then strung some of this through one of the openings in the bottom of the net pot, and filled the netpot up with the clean hydroton. Put the net pot in the lid and repeat until all of the holes have plants in them! I'm about 90% sure that my seedlings will die in a few days and that will be the end of my hydroponics experiment. But who knows. I'll be sure to post updates. 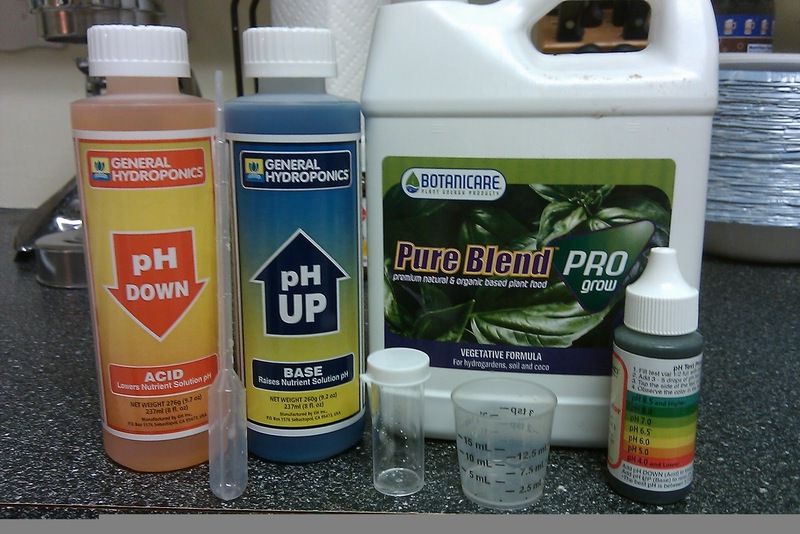 Hydroponic nutrients and ph control stuff. My hydroponic DWC grow system. Close up of the little plants in their hydroton-filled net pots. Not a great picture but you can see the roots sticking out there! 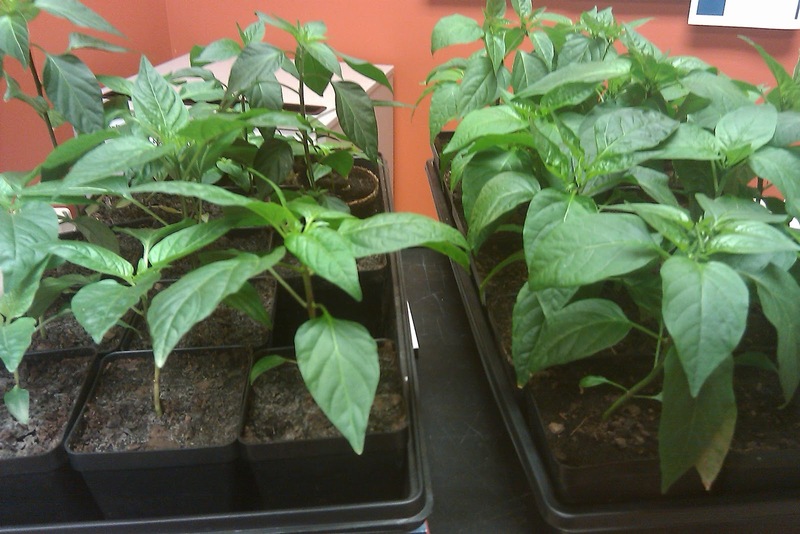 This morning, I started transplanting my hot peppers from the small peat pellets into 4" pots. I am using Miracle Grow Organic Choice Potting Mix, which is very nice compared to some of the other potting mixes I've used in the past. I got the 4" pots from a guy in Chapel Hill last year who apparently used to run a nursery - I've got hundreds of them (free!). I had rinsed them off pretty good last fall before putting them away, but I ran them through the dishwasher to get them good and clean. 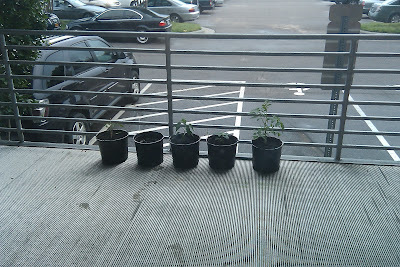 Later today I will also transplant 6 each of my Serrano, Habenero, and Bell ("California Wonder") Peppers. I figure these plants are going to need another 4-5 weeks indoors, which is why I've moved them into the larger pots. It's unlikely that more than 2 of each will actually make it into my garden, but we'll see. Many of them will be container-grown. I'll be making self-watering planters out of pickle buckets I picked up from a local Chick-Fil-A restaurant. More to come on that.